Elliptical trainers are stationary cardiovascular exercise machines that use a variety of measurements for gauging your workout. Often found on the LED console, the distance measurement on an elliptical trainer helps exercisers translate their workout into miles, similar to distance runners. For selecting the intensive exercise, compare the number of miles you complete in of 30 minutes of elliptical training with 30 minutes of jogging and gauge the exertion of one exercise over the other. Elliptical trainers combine the traditional running stride with a sweeping motion similar to skiing. While this plays a beneficial role in reducing the impact of the exercise on your knees, hips and back, it can also be confusing for comparing an elliptical mile to a running mile. Many exercisers find it easier to complete miles on the elliptical machine than by running on actual land, raising concerns about the accuracy of elliptical distance measurements. Depending on the model, an elliptical machine generally displays distance in miles, kilometers or steps. Since the stride of each step is the same length, the amount of miles or kilometers is determined by how many steps you complete. Since changes in elevation would naturally shorten or extend a person's stride, the total miles calculated by the elliptical machine are often referred to as an estimation rather than an exact count. The striding motion performed on an elliptical trainer is unique to the machine, and is difficult to compare to other distance activities such as running. An individual who can perform 10 miles with relatively little difficulty on an elliptical trainer may have a hard time completing two miles of running on dry land. Because of this, many exercisers use the distance setting only as a general measurement to help them improve their performance by increasing the total miles or steps completed each workout. 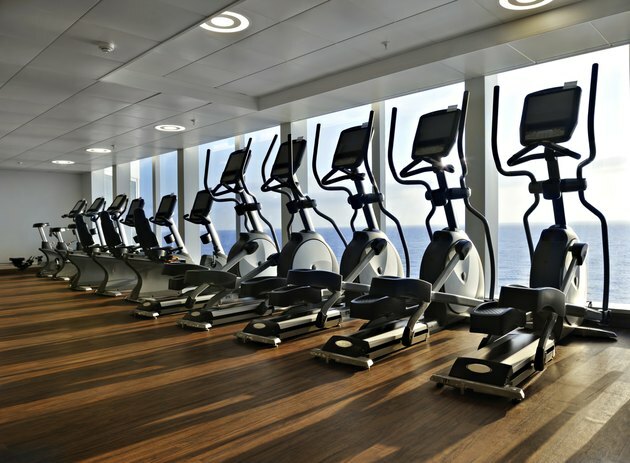 Some gyms and health centers also use the distance function on elliptical trainers to hold motivational competitions, such as the "around-the-world" challenge. Like all cardiovascular exercises, running on an elliptical machine can cause complications for individuals with heart or lung problems. Talk to your doctor if you are new to aerobic exercise or have an injury that may complicate your ability to exercise on an elliptical machine.